Until just a few years ago, part of being a kid meant having to make use of a poorly spec’d, heavy bike with outdated components that really didn’t ride that well. Our favorite bike mechanic called this “The curse of the kid bike”. However, it seems those days are over. 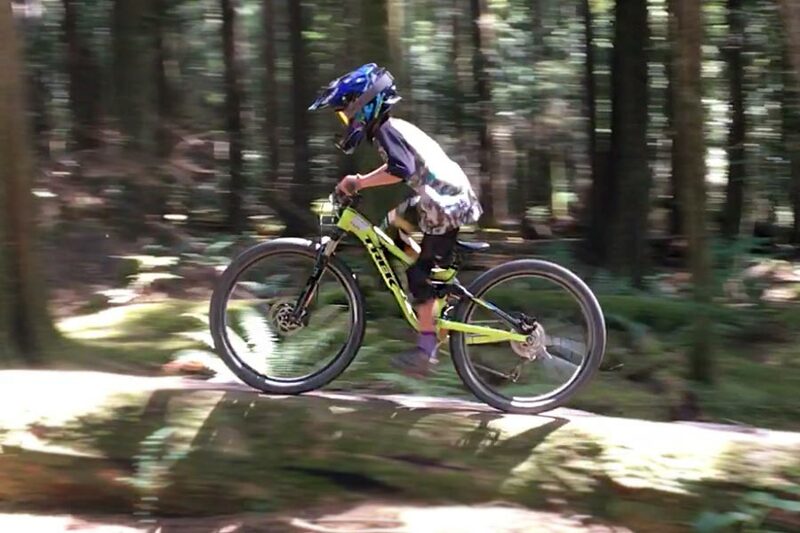 Several bike manufacturers are producing high quality bikes aimed at little shredders. Take a close look at the 2016 Trek Fuel Ex Jr.
Our test rider has been putting the Trek Fuel Ex Jr. through its paces all over the place over the last few months. This is the skills park in Moab, Utah. Weight: 30.8 lbs. We’ve added a RockShox Reverb, Deity composite pedals and Bontrager XR4 Expert tires. Dropping In With The Trek Fuel Ex Jr. 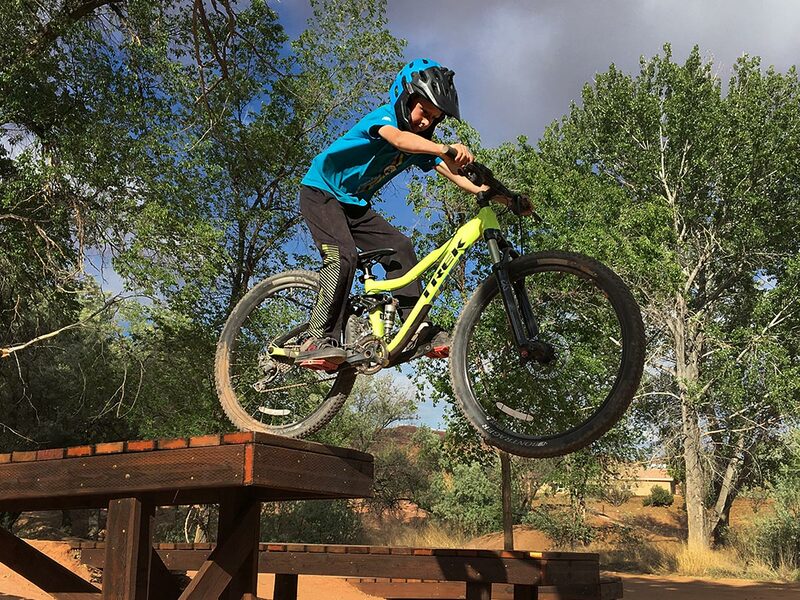 This mountain bike is one of the first full suspension trail bikes that has the geometry and components to make it perform for a child just the same as a full-sized trail bike works for an adult. Saying that, it also comes at a higher price tag than most kid’s bikes. So the question is, is it worth it? Well the answer to that will of course depend on the types of trails she/he likes to ride. Our test rider is ten years old, weighs 63.6 lbs. and it 56” tall. His inseam measures 26”. He’s competent on a mountain bike. This allows him to use all the bike’s features to their limits and and offer credible feedback. The bike perform as well as Trek advertises it to. Just like an adult on a full sized bike, our rider was pushing to improve his skill level by riding things that quite frankly, would not be possible on a lower-end children’s bike. Our kid has climbed hills much more comfortably and descended technical terrain with confidence on this rig. He has enjoyed the bike on cross-country rides over 20 miles long. The bike also performs without a flaw on a bike park’s flow trails and technical terrain. We really wanted to have our son try this bike at the end of last season and get him off his old 24” bike with a cheap seized-up fork and cantilever brakes, but he just wasn’t tall enough. As we’ve been riding with our kids, we’ve discovered something we like to call the Bail-ability Factor. This is when your kid has to quickly get off the bike due to steep terrain. a narrow feature, or other technical gnar. The standover height regarding a bike’s Bail-ability Factory is the critical variant. 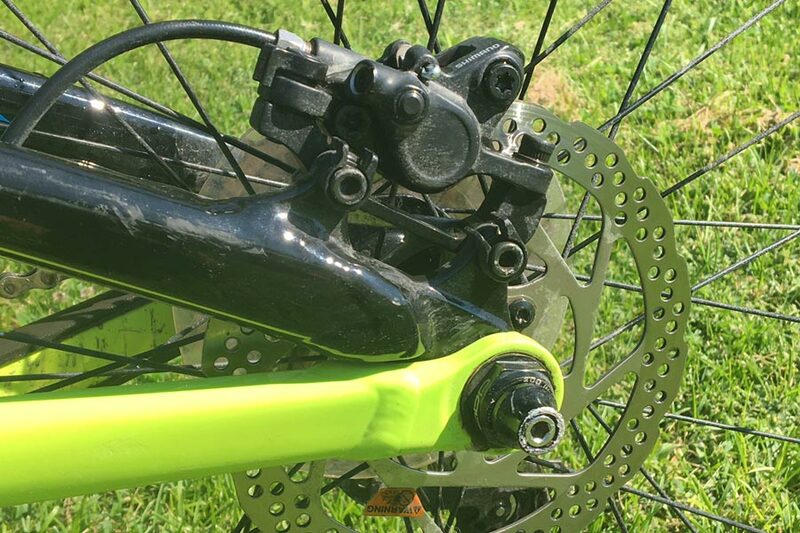 A mountain bike too big will not allow your kid to firmly plant her/his foot on the ground fast enough when they need to his the eject button. Of course crashing happens – but you can limit some of them by having the right size bike. The Trek Fuel Ex Jr. has been given a low volume 90mm X-fusion Microlite RL air shock at the rear which works very well under our kid given his light weight. It features a lock-out adjustment for climbing. On the front is a 90mm X-fusion Velvet RL air sprung fork with a lock-out feature as well. 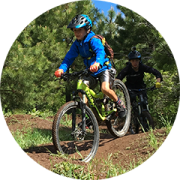 Together the front and rear suspension provide all of the traction and bump absorption that your little one will need on a moderately technical trail ride or laps in the bike park. The air suspension also means you can set the air pressures for your child’s specific weight and riding style. 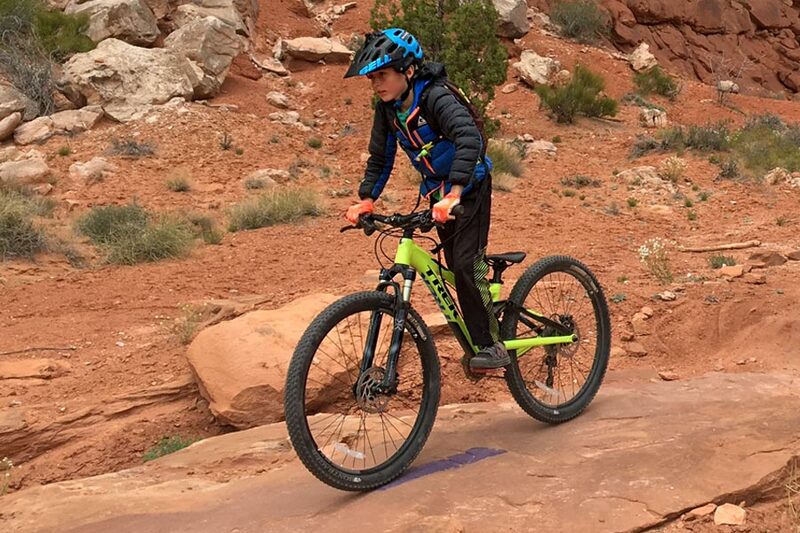 Depending on the terrain we’re riding, our young mtb rider will request adjusting the air in the suspension. As far as sizing goes, this mountain bike will fit riders around 4’4” to 5’ tall. The 12.5” frame has been sized to fit small riders but makes use of 26” wheels. 26” wheels might be coming to an end in the adult mountain bike world, but for smaller riders, they offer the ability to roll over terrain relatively easily without raising the bike’s stand over height too much. We love the 26” wheels on this bike because even though our kid may out-grow it in just a season or two, it is the perfect fit for now. It allows him to control the bike and pedal efficiently. We are going to upgrade the wheels to tubeless wth a D-I-Y method or invest in 26” tubeless rims and lighter hubs. The top tube on the frame is quite short, there are no reach issues. Just a comfortable and natural riding position. 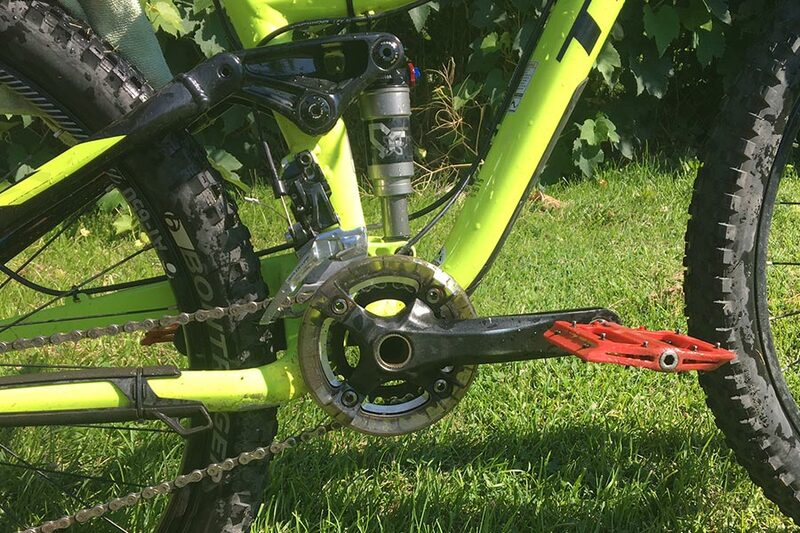 As with everything else on this bike, the drive train is also child friendly. The cranks used are 160mm long, which are perfect for keeping the little legs spinning. 10 gears are found on the back cassette, and there are two gear rings up front. This offers a wide range of gear ratios for your child, making it easier for them to tackle obstacles such as steep hills. If your child does not have experience with multiple gears, this bike will encourage them to learn when to shift properly. The cockpit is also, you guessed it, child sized. The bars are a narrow but fitting 580mm. 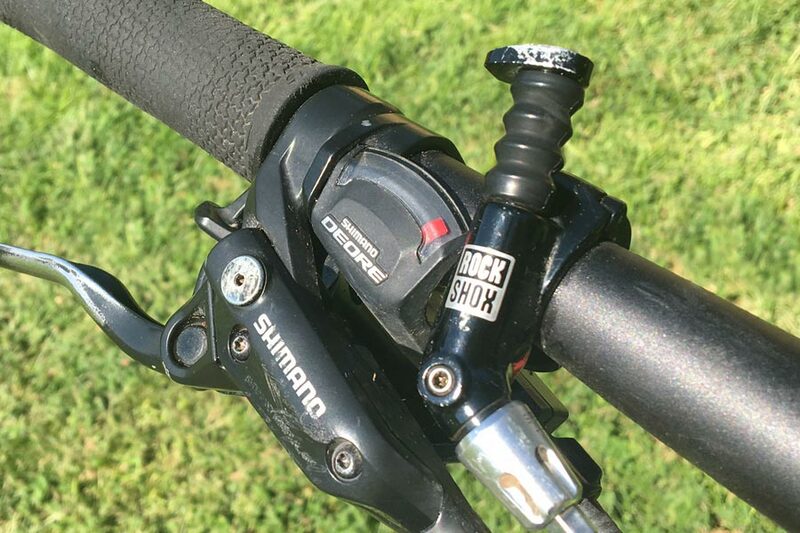 Attached to them are good quality Shimano Deore trigger shifters, which is a huge step up from the awkward twist shifters that are often placed on children’s bikes. The brake levers are not adjustable which may not be optimal for shorter fingers. Most kids should not struggle with them though, and if need be, they could always be swapped out. The hydraulic disc brakes do provide ample power which is essential considering the fact that this bike may just make your child ride faster than ever before. Trek prices the 2016 Fuel Ex Jr. at $1,890 US. If you can afford it, do not be discouraged by this number. It’s truly a “you get what you pay for situation”. This isn’t the bike to buy if your child wants to ride to ride around the neighborhood. 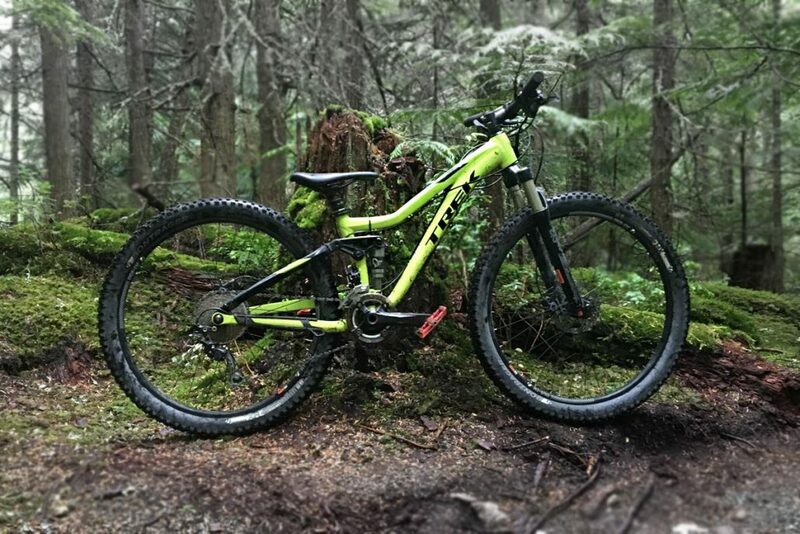 If go mountain biking with kids in the dirt, or your child is pushing the limits of their current trail bike, the Trek Fuel Ex Jr. is absolutely worth it. 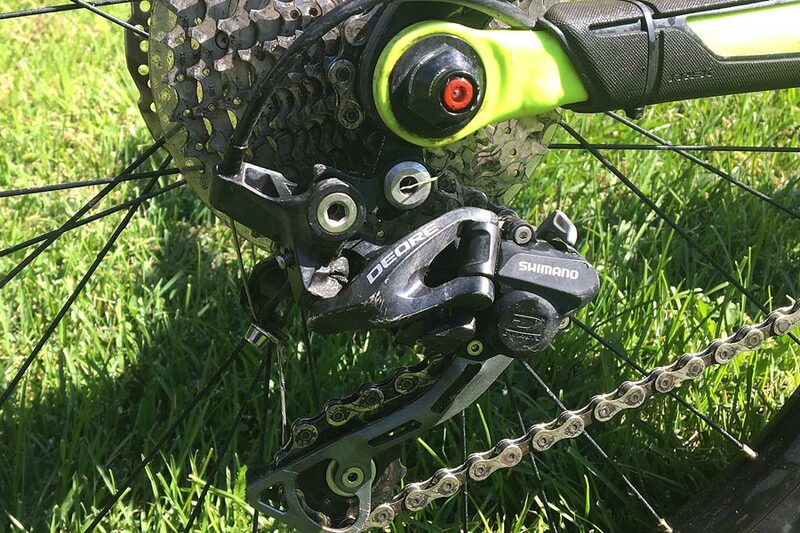 If your child is into downhill racing or taking on expert terrain in the bike parks, you should consider a downhill rig with a 1x drivetrain and dual crown fork. A lighter, hard tail cross-country mountain bike may be the best option if your mountain biking family’s idea of the perfect ride is hammering out climbs at a quick pace and racking up the miles on less technical terrain. This is a killer all-mountain bike for the right sized young rider. It doesn’t matter if your your mountain biker has strong cycling skills, or if she/he is just starting out. The comfort, and superior build quality that this machine offers will inspire confidence and have your little one excited to hit the trails.